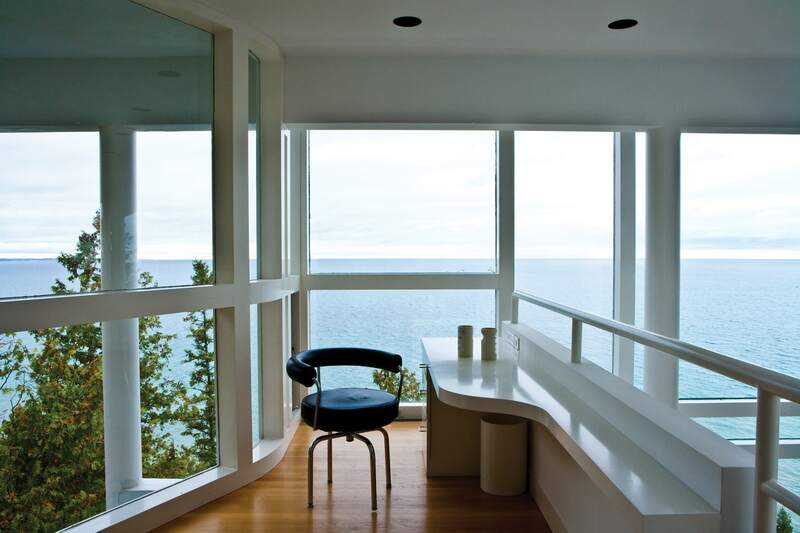 In 1970, a couple dreamt of a Modernist home on a remote Lake Michigan bluff deemed “unbuildable.” Four decades later, the Douglas House is an icon, pushing the limits of Modernism in previously unimagined directions. 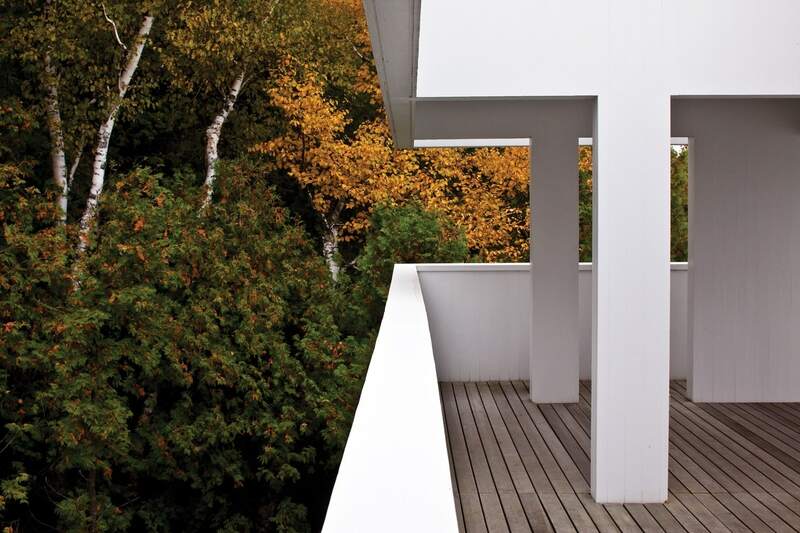 Built for Jim and Jean Douglas in 1973, the home clings to a dizzyingly steep slope above Lake Michigan near Harbor Springs instead of being set on a lovely, if less dramatic, lot in the resort community of L’Arbre Croche, where the Douglases had originally intended it. As history has it, when the Douglases presented their idea to the L’Arbre Croche developers for a Modernist structure featuring a glass-and-white exterior, they were told only earth-toned exteriors were permitted in the subdivision. The Douglases, owners of a trucking company who lived in a Midwest Victorian home in Grand Rapids with their three children, may seem unlikely candidates for a Modernist adventure in architecture. 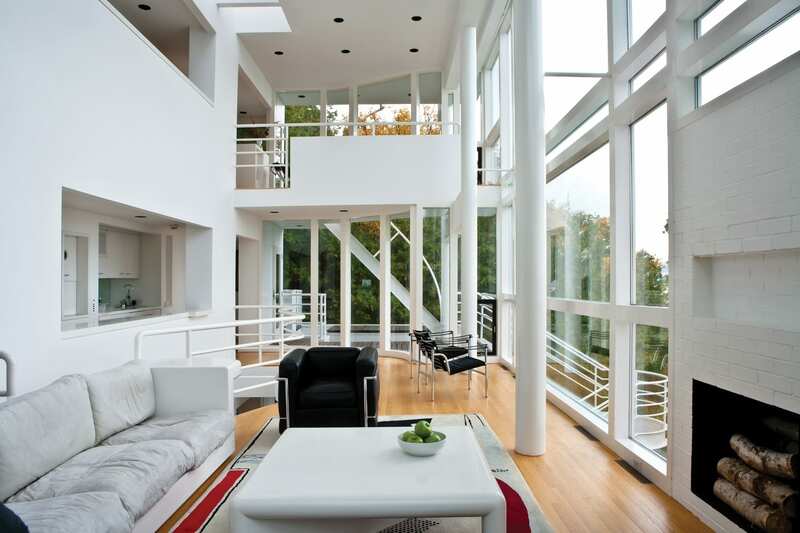 But the couple had fallen in love with the “Smith House” by architect Richard Meier and requested that he build a similar home in Northern Michigan. Months of property hunting later, the Douglases found a piece of land that local opinion considered unbuildable—a steep slope covered in cedar, birch and spruce wound down to aquamarine shallows of Lake Michigan. The Douglases bought it anyway, having faith in their vision. 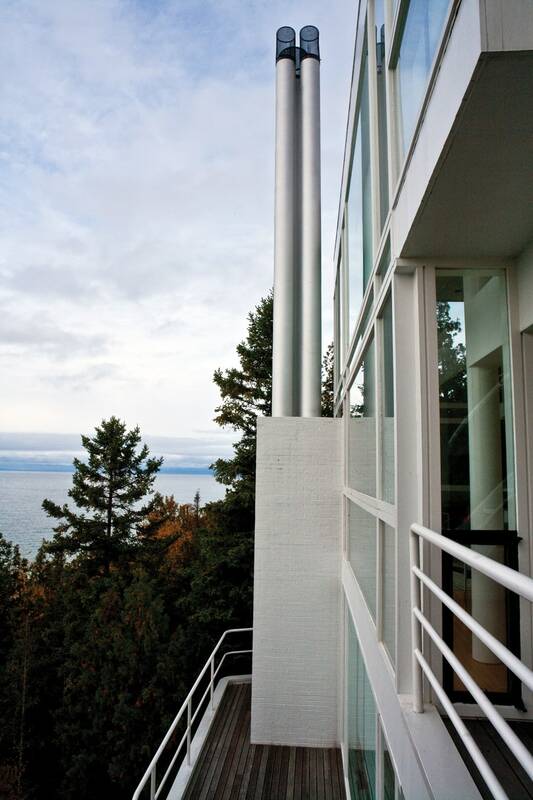 When the home was finished in 1973, glass and white-lacquered wood, spilled four stories down the slope from its deceivingly low one-story entrance at the bluff’s precipice. 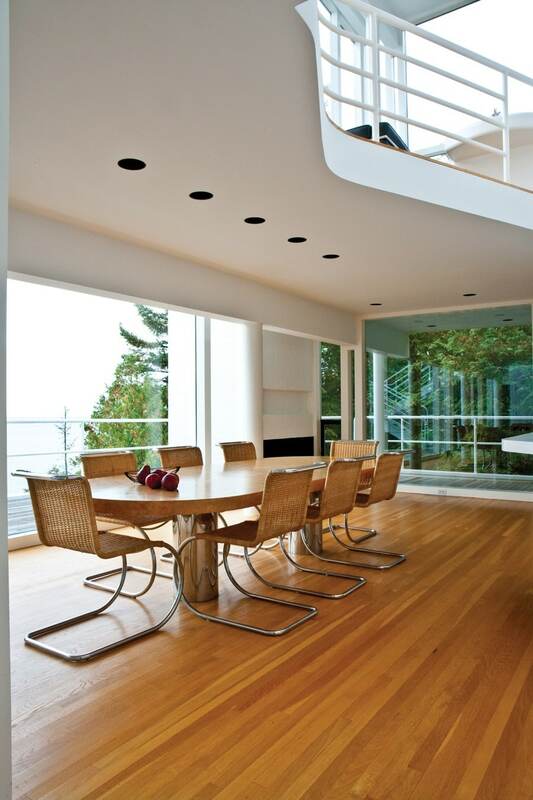 Floor-to-ceiling views of lake, sky and trees commandeered the interior. The effortless grace of the structure belied a major, three-year construction project whose complications were compounded by the rural location. The Douglases hired a construction company from Grand Rapids, and logistics included transporting a pile-driver rig, driven at a crawl the 200 miles north to the building site. Garon Gopigian, who has summered across the street from the home since it was built, remembers the summer of 1971 when the 40-foot piles that the home would sit on were being driven deep into the clay slope. “It was relentless pounding all summer long,” he says. It was important to the Douglases that only a few trees were removed during construction. A tree was left on the lake side that was only a foot from the house. The home was outfitted with furnishings that included Le Corbusier chairs in the living room and Mies van der Rohe dining room chairs. 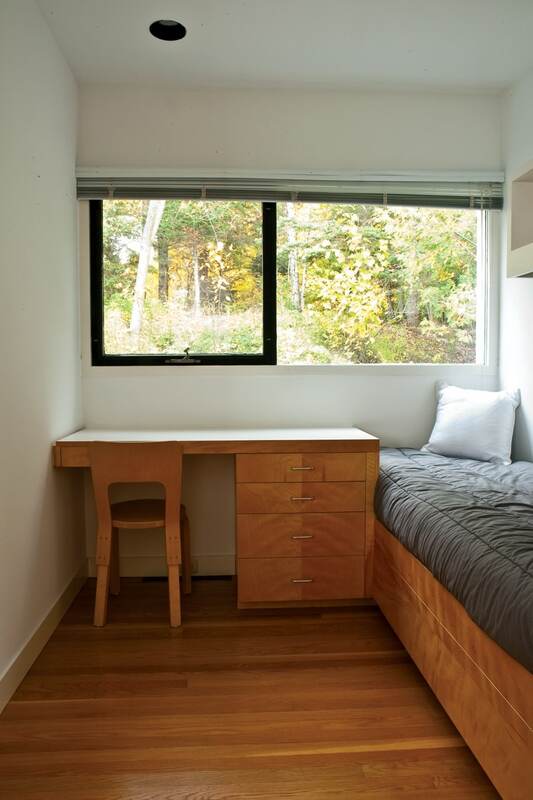 Built-in desks and beds were put in the children’s ship cabin-inspired bedrooms. 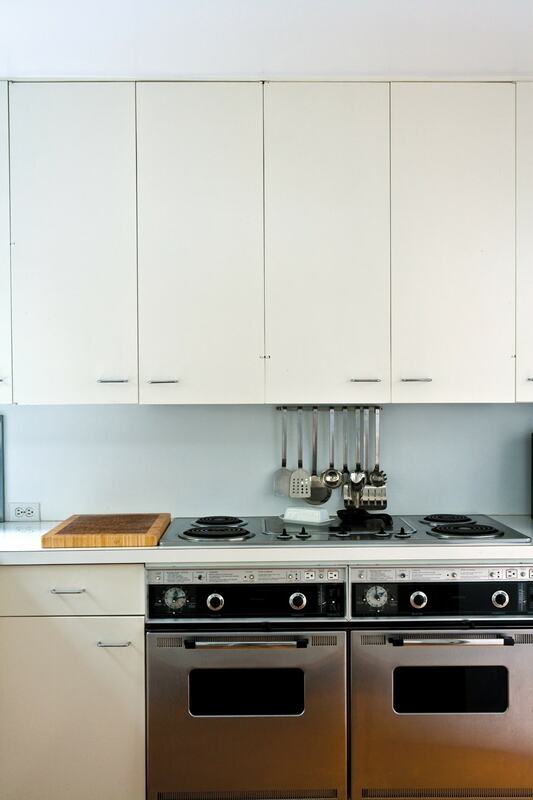 Every detail was thought through, right down to the stainless steel paper towel holder built into the kitchen wall near the sink. When the home was finished, it needed almost no adornment—the all-encompassing view with its infinite permutations of the interaction of sun, clouds and water was all the decoration it needed. That same year, the magazine Global Architecture devoted an entire issue to the home, including 40 stunning photographs by Japanese photographer and the founder and editor of Global Architecture, Yukio Futagawa. Goldberger wrote the text. In 1976 the Douglas House was given one of six Honor Awards by the American Institute of Architects—the only single-family residence to win that year. Even as the house gathered fame, it was, as intended, a fabulous year-round home to the Douglas family. Gopigian, who was friends with the Douglas children, has wonderful memories of playing in and around the house—scaling the white metal climbers and playing Monopoly on the burl oak table. At the end of the 1970s, the Douglases sold the home and moved from Harbor Springs. By the time the third owners—J. Paul Beitler and his wife, Penny Powers Beitler—purchased the Douglas House in 1983, a full restoration was required. The home’s second owners had added carpeting, foil wallpapers, heavy drapes, and early American furniture. The Le Corbusier and Mies van der Rohe furniture was in need of repair or in some cases replacement. The house, closed during winters, had substantially deteriorated due to thermal and water intrusion. At the time, Beitler was just beginning his career as a commercial real estate developer in Chicago. Eventually, his firm Miglin-Beitler would become one of the most prestigious real estate development companies in Chicago. Over the course of his career, Beitler says he received the equivalent of an architectural degree working with the world’s greatest architects. Beitler understood Modernism, and he knew the importance of the Douglas House. The Beitlers launched their restoration by contacting the architect for the original drawings, then went on to have the Le Corbusier chairs reupholstered and the Mies van der Rohe dining table chairs re-caned. The glass walls needed repairing, so the Beitlers hired a specialist who’d worked on Chicago’s Sears Tower and the John Hancock Building. In fact, the only change the Beitlers made to the original design was the addition of a custom rug for the living room seating area designed to replicate a tapestry done by Le Corbusier for a Japanese theater. Beyond its Le Corbusier design, the rug is also important, Beitler explains, because as you descend into the living room your gaze is directed downward, not to the walls. “So the art is on the floor,” he says. The Beitlers’ efforts were rewarded with a 1988 article in Architectural Digest recounting the return of the Douglas house as an iconic masterpiece. The home’s fame made it a mecca for architecture aficionados, occasionally creating privacy issues, such as the time a group of students simply walked in the front door. The Beitlers politely toured them around—then had a security system installed. In 2007, the same year the American Institute of Architects named the Douglas House as one of 150 buildings on their America’s Favorite Architecture List, the Beitlers passed their stewardship to Michael McCarthy and his wife, Marcia Myers. Retired executives of Procter & Gamble, the couple had worked their way up through the company over the course of their 30-year careers—one day hoping to have a home on Lake Michigan. When Myers, an Art History major at the University of Michigan in the 1970s, discovered the real estate listing for the Douglas House on the internet, she knew she’d found both their dream home and a work of art. The couple has stepped into the role of stewards of the 40-year-old house where the Beitlers left off. We are building on his “mission to engage with architects and master builders to ensure the living breathing creation is kept technically and artistically as originally designed,” McCarthy says. Restoration projects in the past two years, overseen by McCarthy, an engineer, include installing redwood framing on the signature curtain wall on the lakeside, a new, high-efficiency heating system, repointing the brick chimneys, re-roofing the upper deck, and rebuilding the awning windows with argon filled panels. 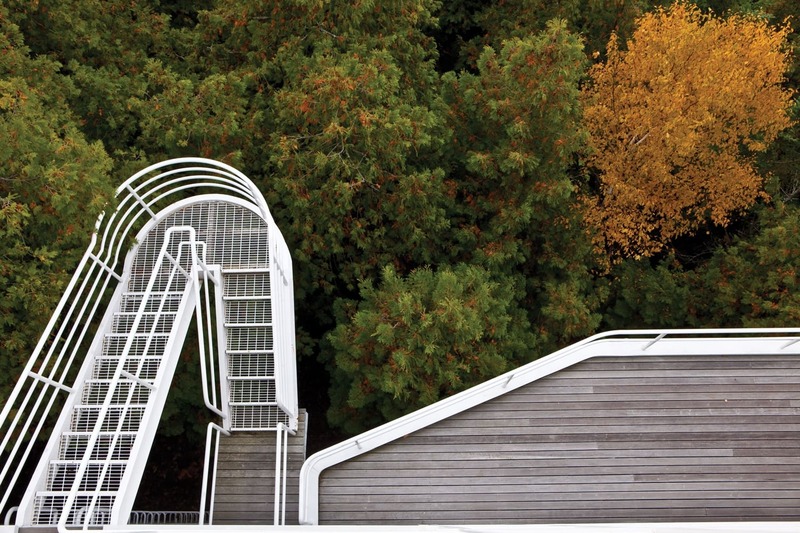 Petoskey architect Nicholas White helped with a historically correct restoration of the home’s signature entry bridge. The couple watches thunderstorms roll over the lake, snowstorms white-out their view, and ice caves form, cold wave by cold wave. A family of bald eagles flies past the home at least once a day. Circling and migrating hawks are a constant. The couple sees fish schooling or fanning their beds down in the shallows of Lake Michigan from their house. 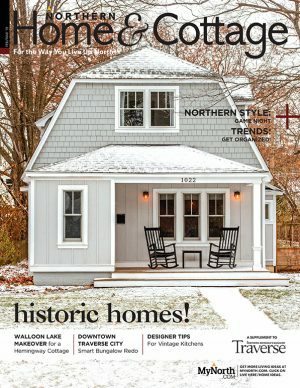 This story was featured in the December 2009 issue of Northern Home & Cottage. Click the cover to read the latest issue of the magazine.